We have recently begun work on modernising the user interface of FX Draw. Don’t worry! We will definitely NOT be making wholesale changes that require you to learn something new. We are just trying to make things more useful on more devices. The first change is the addition of on-screen buttons that allow you to delete selections and edit the properties of figures. 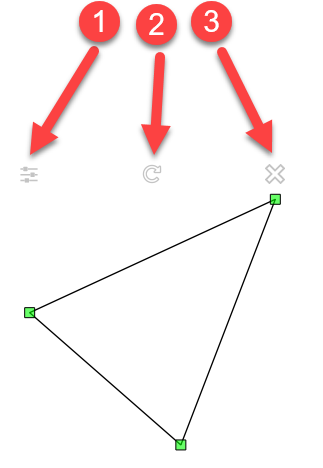 If you draw a figure and select it, you will see these new buttons. Button 1 will only appear if you have selected a single figure. It allows you to edit the properties of the figure. It is equivalent to right-clicking on the figure (or Command + Click on the Mac). Button 2 is the rotate button re-imaged. The rotate button’s behaviour has not changed but the button now gives you more information about what it does. Remember that not all figures are rotatable so this button will not always appear. Button 3 allows you to delete the current selection. It is equivalent to pressing Del. The need to right-click to edit properties and press Del to delete figures makes FX Draw a little harder to use than it needs to be on Mac computers and tablet computers. It also makes it harder to move FX Draw onto new platforms (like the iPad). Adding these buttons makes the interface more accessible to everybody without removing ANY of the functionality you are used to. Keep an eye on our products over the next few months. There a lot of little enhancements like this one coming soon.